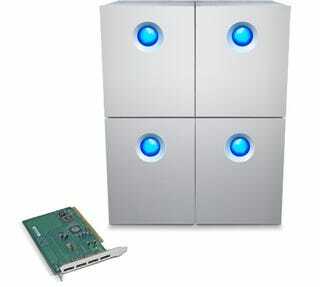 LaCie's new series of RAID bundles include an 8TB model of the 4big Quadra, which is actually just two 4TB hard drives put together. The 8TB model joins the 4big Quadra series—a 4-bay RAID solution that features swappable disks and seven RAID modes—that boasts transfer speeds up to 700MB/s and capacities as big as 32TB. The hard drives with higher capacities, like the 8TB, are also just bundles of smaller drives placed together.